Arcane Mapper is a mapping tool designed for Digital or Virtual Tabletops and printing for physical play. Put together high quality maps for D&D, Pathfinder, GURPS, Hero or any other Pencil and Paper RPG system – whether on the table top or virtual. It features a simple to use interface for drawing out rooms, adding objects and adding atmosphere with high quality lighting. Arcane Mapper will be available soon in Early Access for $9.99 on Steam – Steam Store Page. Arcane Mapper is an easy to use tool for creating maps for roleplaying games. The tool can produce top down, forced perspective 3D looking environments that mesh well with simple images for objects – no modeling or 3D experience required. 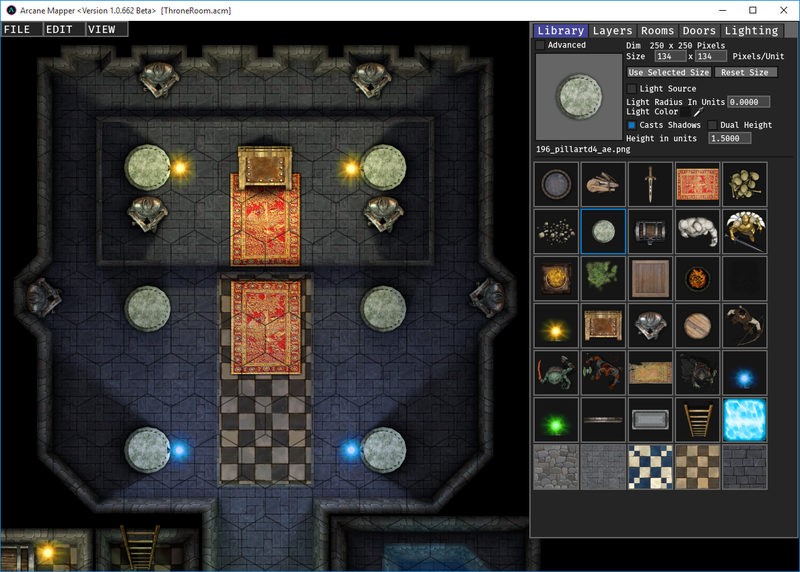 With free assets available for private use on the internet, this software allows you to put together high quality maps for your games with less effort, without constraining you to predefined map pieces, tiles or limited assets. Easily render out high quality images for Virtual Tabletop games or print out maps for a physical tabletop game. Even save out .PSD files that preserve the layers for Photoshop if you are more artistically inclined. Longer term after the initial release, I am planning on adding Digital Desktop and possibly Virtual Desktop features with high quality real time lighting and fog of war with an easy to use interface for GMs and players. Note all features will be available in the first Early Access release and additional features may be added. Rendering high quality images (such as JPG, PNG, PSD) for use with Virtual Tabletops such as Roll20. Printing high quality images from your maps for Physical Tabletop play. Drag and Drop images directly onto your map, drop folders or selected files to add many images at once to your Library. The ability to import and export libraries where assets are already setup with scaling, lighting and shadow settings. Easy to use interface for adding objects to your maps, scaling, moving, rotating and placing them rapidly. Supports a full set of configurable hot keys. Full undo and redo support. Layers to organize objects and environments with the ability to decide which layers cast shadows and are affected by lighting. Draw arbitrarily shaped rooms and easily connect them together. Each room can have its own settings, textures and look. Draw pits, lowered sections, stairs and raised platforms right into your rooms. Procedural liquids to fill your pits and help you create sewers and water ways. Procedural details such as dirt, mold and spider webs. High quality lighting with soft shadows, any object can be a light and any object can cast shadows. High quality ambient occlusion to ground your objects in the map. Seamless exterior and interior maps with layers to support roofs. Multiple maps in one – see maps below the current map with fading or fogging – to give large buildings and dungeons a sense of depth.